Cultivated for thousands of years, orchids are the largest family of flowering plants. There are more than 22,000 species of orchid, with almost 1,000 new varieties added every year. Since the 19th Century, and the discovery of tropical species and their subsequent cultivation, over 100,000 hybrids and cultivars have been produced. Our human history with orchids goes back quite a bit longer than the Victorian era, though. The ancient Greeks associated orchids with fertility. They believed that the gender of an unborn child could be determined by which parent ate a particular kind of orchid; if the father ate large, young, orchid tubers, the child would be male, whereas if the mother ate small tubers, the child would be female. There’s no evidence this is the case today, but if you and your wife (orchids are almost exclusively given to women today) are trying for a baby, this might be a thoughtful gift, with a meaning special to just the two of you. 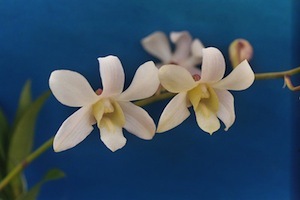 In the Victorian age, British explorers and travelers returned home bearing tropical orchids, and set about cultivating them in hothouses and conservatories. In 1862, Charles Darwin published “Fertilisation of Orchids”, setting off a spree of activity up and down the land. Even so, the orchid remained a rare and precious plant, and because they were so expensive and hard to find at the time, they came to symbolize luxury. This image persists today, with the orchid symbolizing love, beauty, luxury and strength; the long-lasting orchid makes a perfect gift for the special someone in your life. Did you know that vanilla is the product of a member of the orchid family? Not, I hasten to add, that I’m suggesting you should buy your beloved vanilla pods for any special occasion. Better stick with flowers, for even the most fervent gourmand in your life. You can choose from a wide variety of shapes (symmetry is often highly-prized) and colors. Like many other flowers, white signifies purity and peace; red love; orange passion; yellow friendship and blue mystery. The orchid is the most popular flower today, and none other has the ability to flatter and delight in quite the same way. They really are the most special choice for the most special people in your life. Much better than a vanilla pod.